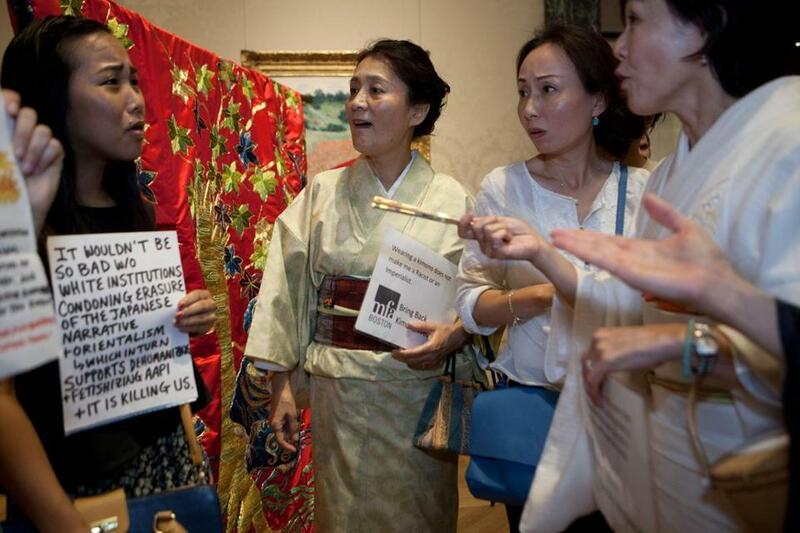 Matsuko Levin (center), Danyeun Kim, and Etsuko Yashiro were at odds with a group of younger women protesting at the MFA. A playful attempt by the Museum of Fine Arts to engage summer visitors has triggered a controversy that is mushrooming beyond expectations, with protesters taking to the museum’s “Kimono Wednesdays” event in increasing force each week, and a group of kimono-wearing counterprotesters joining the fray. The debate has reached such a pitch that incoming MFA director Matthew Teitelbaum, who arrives in August, has announced plans for a future symposium, developed with input from MFA audiences, on art history and traditions of representation. It all began with a celebration last month for departing director Malcolm Rogers, when the museum invited visitors to “channel your inner Camille Monet” by trying on kimonos and posing for photos next to Claude Monet’s painting “La Japonaise.” Art historians consider the 1876 work, which depicts Monet’s wife wearing a kimono, to be a witty poke at Parisians’ fascination with Japan. The Museum of Fine Arts is hastily pulling back on an event that protesters labeled latter-day form of racist minstrelsy. That didn’t satisfy the protesters, who have seized the opportunity to raise broader questions involving racism, sexism, and colonialism. The furor reached new heights on Wednesday as about two dozen protesters and half as many counterprotesters filled the MFA’s Impressionist gallery. On one side, a group of mostly young Asian-American and white women gathered to protest “Kimono Wednesdays,” demanding additional context for the event and questioning views of Asians as “the other” in American culture. Claude Monet’s “La Japonaise” at the MFA. Displaying a sign reading “Decolonize our museums,” a woman who gave her name only as Pampi, 36, spoke about the need to trace artworks to their first acquisitions, which she said were often violent, and charged the MFA with shirking its responsibility to curate the event for a diverse American audience. Etsuko Yashiro, 53, of Concord, who helps organize Boston’s Japan Festival, said she was there to share the beauty of kimonos with an American audience. Ikuko Burns, 79, who was born in Tokyo and has lived in Boston for 53 years, explained how she used to bring kimonos to local schools as a consultant for the Children’s Museum to teach introductory lessons on Japan. “I’m a little bit disappointed by the other side,” she said, questioning what the protest had to do with Monet’s painting and chalking it up to the participants’ youth. In her MFA “Spotlight” talk on Wednesday, museum educator Wendy Dodek spoke of Commodore Matthew Perry’s “gunboat diplomacy” of the mid-19th century and — addressing a question raised by protesters the previous week — relayed the fable depicted in the Monet painting’s kimono, which revolves around a warrior named Taira No Koremochi. Though museum security reminded visitors repeatedly to keep their voices down, conversations between protesters and counterprotesters became emotional at times. Standing with her fellow protesters, Shaina Lu, 25, of Jamaica Plain, said she sensed a misunderstanding between the opposing sides. Those with concerns about the event would also like to see the kimono celebrated, she said, but in a “culturally affirming” way. “This is part of the misunderstanding: We never said people who aren’t Japanese can’t wear a kimono,” said Loreto Ansaldo, 35, of Hyde Park, who helped organize the protest. In Boston’s broader Japanese and Japanese-American communities, opinions of the controversy varied widely. “I have talked to many people, including Japanese and Japanese-Americans, that didn’t find the event offensive on its face,” said Paul Watanabe, who directs the Institute for Asian American Studies at the University of Massachusetts Boston. Still, he agreed with the museum’s decision to recast the program. Watanabe said MFA staff could have avoided the controversy by better contextualizing the painting within a discussion of cultural appropriation and by clarifying what they hoped visitors would gain by donning replica kimonos. “Their original idea was done, unfortunately, without a lot of thought and care about what its consequences might be,” Watanabe said. Ken Oye, copresident of the Japanese American Citizens League’s New England chapter, had his own take. “This is a funny controversy,” said Oye, stressing that he was speaking personally and not on behalf of his organization. The painting is rooted in the idea of cultural borrowing, he said, and understanding the debate requires acknowledging the painting’s complex context, including both French infatuation with Japan and the corresponding Japanese infatuation with French Impressionism. 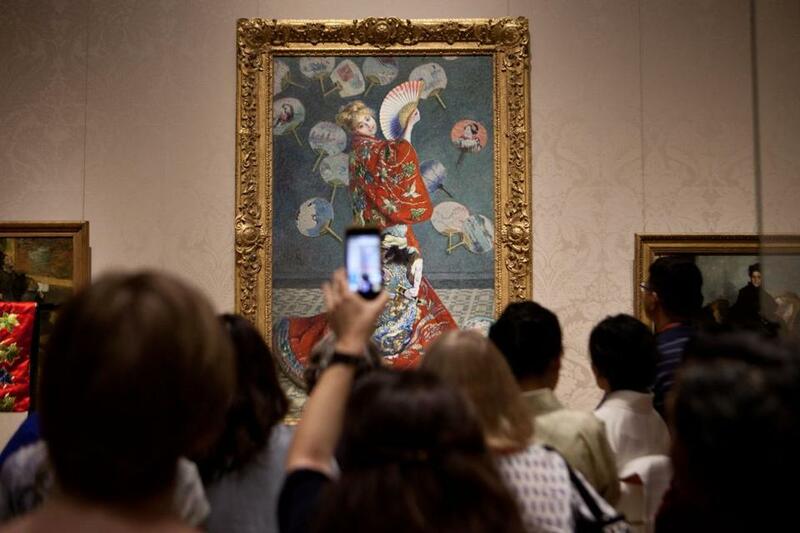 “Sitting in the last room of the Orangerie [Museum in Paris] surrounded by Japanese tourists staring at Monet’s work and gawking — that’s part of this,” he said. Stephanie McFeeters can be reached at stephanie.mcfeeters@globe.com. Follow her on Twitter @mcfeeters.